So, here’s a primer on Artistic Activism, and 9 reasons why we’re so into it. You can also download the printable version of this booklet. Artistic Activism is a dynamic practice combining the creative power of the arts to move us emotionally with the strategic planning of activism necessary to bring about social change. Art and activism do different work in the world. Activism, as the name implies, is the activity of challenging and changing power relations. There are many ways of doing activism and being an activist, but the common element is an activity targeted toward a discernible end. Simply put, the goal of activism is action to create an Effect. Art, on the other hand, tends not to have such a clear target. It’s hard to say what art is for or against; its value often lies in providing us perspective and new ways to envision our world. Its effect is often subtle and hard to measure, and confusing or contradictory messages can be layered into the work. Good art always contains a surplus of meaning: something we can’t quite describe or put our finger on, but moves us nonetheless. Its goal, if we can even use that word, is to stimulate a feeling, move us emotionally, or alter our perception. Art, equally simply stated, is an expression that generates Affect. At first glance these aims seem at odds with one another. Activism moves the material world, while Art moves the heart, body and soul. In fact, however, they are complimentary. Social change doesn’t just happen, it happens because people decide to make change. As any seasoned activist can tell you, people just don’t decide to change their mind and act accordingly, they are personally moved to do so by emotionally powerful stimuli. We’re moved by affective experiences to do physical actions that result in concrete effects: Affect leads to Effect. We might think of this as Affective Effect, or perhaps, Effective Affect. Or, combined in a new word, Æffect (pronounced Aye-fect). Artistic Activism is a practice aimed at generating Æffect: emotionally resonant experiences that lead to measurable shifts in power. The first rule of guerilla warfare is to know the terrain and use it to your advantage. Today, this doesn’t mean studying maps of the mountains of Cuba or the jungles of Vietnam. Our modern political terrain is a highly mediated landscape of signs and symbols, story and spectacle. To operate successful on this cultural topography we need to observe, analyze and respond creatively. We need to be Artistic Activists. We may like to think of politics as a purely rational business, where sensible people logically discuss and debate the issues at hand, come to a reasoned decision, and then judiciously act. Certainly this is how politics has been taught to us in our civics classes. But as recent developments in cognitive science suggest, humans don’t think and behave this way: we make sense of our world through stories and symbols that frame the information we receive and then act accordingly. The principles governing civic action are more likely to be found in the worlds of popular culture and entertainment, and artistic expression and reception, than in textbooks of political science. Acknowledging that the political landscape is also a cultural landscape opens up new terrain to work upon. Whereas art tends to be limited to museums and galleries, and activism to street demonstrations and state houses, artistic activism is at home in town squares and shopping malls, on billboards or through social media…as well as galleries and state houses. This new terrain, neither overtly “arty” or “political” is more familiar and safer to an audience than a museum or a rally, and thus makes artistic activism more attractive, approachable, and friendly than traditional art or activist practices. Artistic activism – as an affective image, performance, or experience – is also well suited for an age of cell phone cameras and social networks. People don’t share policy papers, they share things that move them. While Artistic Activism is particularly well suited for the contemporary moment, throughout history the most effective civic actors have married the arts with campaigns for social change, using aesthetic approaches to provide a critical perspective on the world as it is and imagine the world as it could be. In the struggle for Civil Rights for African Americans in the US, for example, activists drew upon the stories and songs and participatory culture of the black churches, staged media-savvy stunts like Rosa Parks refusing to give up her seat on a segregated bus, played white racist reaction against peaceful protesters as a sympathetic passion play during the campaign to desegregate Birmingham, Alabama, and, most famously, used imaginative imagery (and popular cultural references) in a speech to call America to task for its racist past and articulate a dream of a better future. While Martin Luther King Jr is now largely remembered for his example of moral courage, social movement historian Doug McAdam’s estimation of King’s “genius for strategic dramaturgy,” likely better explains the success of his campaigns. From Jesus’s use of parables to engage his audience, to dramatizing “this is what democracy looks like” in public squares around the world in 2011, working artfully makes activism effective. Many activists know this intuitively, but by naming it “artistic activism” we take what would be a folk art and turn it into a defined practice — giving it the attention and study it demands. Art and activism often conforms to expectations — and for many people those expectations are, unfortunately, negative. Artistic activism is activism that doesn’t look like activism and art that doesn’t look like art. The ability of artistic activism to surprise us – to show up in unlikely places (e.g. not a gallery) or take on unfamiliar forms (e.g. not a protest march) provides an opportunity to disrupt people’s preconceived notions of art and protest, and their predetermined ideas about the messages we are trying to communicate. Artistic activism creates an opportunity to bypass seemingly fixed political ideas and moral ideals and remap cognitive patterns. Surprise is a moment when hearts can be touched and minds reached, and both changed. Artistic Activism’s ability to escape easy categorization is a benefit in societies where protest is commonplace. Whereas traditional forms of protest, like marches, need to constantly increase in size or scope, or descend into violence, to become noticed (and newsworthy), the creative innovation at the heart of artistic activism provides something uncommon, or out of place, that can attract attention and become memorable. The boundary slippage of artistic activism works equally well in repressive regimes where overt political protest is prohibited, yet artistic practices are tolerated. Slipping under the radar, artistic activism is not identified as “politics” to authorities while still being able to communicate a social message to the public. “I’m not political,” is a phrase one hears often; it’s a rare person, however, that doesn’t express themself through some form of creativity. We go dancing on the weekends, perform songs in our churches, compose raps with our friends, make memes for social media, customize bicycles, assemble scrapbooks, sew quilts, and prepare dinners for the table. While it takes years of professional training to practice (or even understand) law, policy analysis, or governmental lobbying, creativity is a skill we all already possess and can learn to hone and use to great æffect. Indeed, well-honed cultural creativity and artistic expression is often the possession of those — youth, the poor, people of color, migrants and immigrants — that are most marginalized from formal spheres of politics, law, and education. Artistic activism plays to their strengths. Even with the best intentions, artists and activists can be paternalistic toward those whom they are trying to assist. They, as “experts,” have the knowledge and creativity which they bestow upon “disadvantaged“ people. Artistic activism does not work this way. Here the relationship is reversed: it is the people who possess what is valuable. While culture is something we all share, we don’t all share the same culture. The building blocks – the symbols and stories that give artistic activism its content and form – differ from people to people and place to place. When it comes to local culture the locals are the real experts. Activism is foreign to many people, and a bit daunting: it seems to take too much commitment, too much risk, and too much time. (Oscar Wilde once quipped that “the problem with socialism is that it wastes too many evenings on meetings.”) But that’s why mixing arts and activism works so well. Because we all have a creative life, using the arts – and culture, more broadly – in activist work lowers barriers to entry. Culture, as something familiar, can work as an access point through which organizers can approach and engage people who are otherwise alienated by institutional systems like voting, lobbying, political campaigning, and legislation. Unlike fine arts or political policy, artistic activism takes no specialized knowledge for an audience to “get it.” And, as an art form, artistic activism is always open to multiple meanings and, thus, multiple ways for the audience to connect. Because artistic activism crosses boundaries, it not only opens up multiple access points for creators and audiences, but also for mass media outlets who may cover events in both arts and politics sections, and for funders who can support projects with arts and culture grants as well as through social justice portfolios. There is an art to every practice, activism included. It’s what distinguishes the innovative from the routine, the elegant from the mundane. Creativity is essential to good organizing. It enables activists to imagine new tactics, strategies and goals to keep campaigns fresh and make them more effective. At one time protest marches and mass rallies were powerful innovations; today they are routine. Millions of people may have marched in the streets protesting the American War in Iraq, but public sentiment turned against the war when the mother of a dead soldier – Cindy Sheehan — staged a dramatic encampment outside the president’s vacation home. This was artistic activism. But artistic activism is more than coming up with creative tactics – it stimulates a culture of creativity that extends from tactics through goals to overall campaign planning. Drawing upon creative processes familiar to arts and design, artistic activism encourages blue sky brainstorming, quick sketches, multiple iterations, rapid prototyping, and a spirit of play — as well as risk, and the acceptance of failure. Approached as a creative process, we are more apt to see multiple solutions to problems, and new pathways to attain our objectives. Free to experiment, we may identify and solve problems we didn’t set out to solve, end-running the commonplace framing of politics to open up new possibilities for interpretation and action. 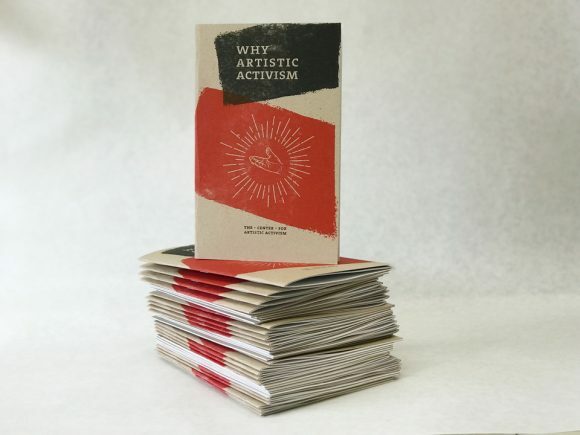 Artistic activism, as an art form, is forever doing things and creating reactions that are unintended — what we might call an “abundance of æffect.” Rather than seeing these unintended consequences as a detriment to be ignored or controlled, the creative process of artistic activism encourages us to notice, reflect, and be open to new creative and political possibilities. Caring about the world is hard work. We open our eyes to things other people do their best to ignore, and in our work we constantly fight against forces greater than us: ancient prejudices, entrenched institutions, well-funded opposition. As an activist it is easy to get burnt out as our life becomes increasingly defined by “the struggle.” As an artist it’s easy to get frustrated that the creative work we do has little impact on the issues we care about so deeply. Artistic activism is a way to connect with the artist inside of every activist and the activist within every artist, redrawing connections so that artistic activism generates fun and pleasure rather than sacrifice and guilt and, in the process, reintegrating and re-energizing our lives. Re-energized people revitalize the institutions they work within. In this way, artistic activism is a form of organizational self-care. The purpose and play of artistic activism can reanimate “dead” cultural and civic organizations like museums, galleries, and NGOs from the inside out — but also from the outside in: creativity is infectious. As fun as artistic activism is for those doing it, it’s also exciting for those people on the outside experiencing it. Artistic activism is not as simple as privileging creativity over clipboards. Petitions still need to be signed and people need to canvass door–to-door, marches need to be planned and politicians lobbied. But making space for creativity makes the necessary drudgery more bearable, and keeps people in the organization longer. And through the practice of artistic activism it just may be possible that a more creative way of canvassing can be discovered. Creating and sustaining lasting change demands a change in values, beliefs and patterns of behavior, that is: cultural change. While changing laws and policies are essential, laws will not be followed nor policies enacted unless people have internalized the values that lie behind them. And while marches, rallies and protests are important, they won’t have lasting impact unless the issues resonate with people. Culture lays the foundation for politics. It outlines the contours of our very notions of what is desirable and undesirable, possible and impossible. Culture makes us, as we make it, and culture is the base material of Artistic Activism. Artistic activism draws from culture, to create culture, to impact culture. An artistic activist might craft an image that prompts people to rethink how we look at reality, or stage a performance which calls into question what values and institutions are “normal” in a society, or create an artifact prefiguring an alternative, better world. In each case, expanding, and prodding what we consider normal, possible, or even conceivable. If artistic activism is successful, the larger culture shifts in ways big and small. To change the world we need to imagine what a changed world might look like. These “utopian” visions are useful for setting pragmatic goals and concrete objectives, and provide a loadstone to orient our direction so we don’t get lost. Most important, these ideas and ideals inspire us to get up and out in the morning to change the world, and attract others to work with us. Articulating our dreams is not easy, as our very ideas of what is possible are shaped by the culture of the world we want to change. But, as Audre Lorde once wrote “Poetry is the way we help give name to the nameless so it can be thought.” Art is a means by which to imagine the unimaginable, and artistic activism is the medium that can suggest it as a possibility. Through sound and image and movement, artistic activism can conjure up a vision of what could be in the future and communicate it to others in the here and now. Art gives us the vision. Activism helps us make the road to get there. A final note. Artistic activism, as a cultural approach, is inherently non-violent. Although groups have used creative methods for violent ends (most infamously the Nazi Party) the tactic itself is peaceful. Artistic activism is aimed at hearts and minds, not bodies or buildings. The goal is not to force compliance, which art can never do, but to persuade by creating moving experiences that prompt people to question the world as it is, imagine a world as it could be, and join together to make that new world real. Artistic activism is Æffective power.